In January 2013, Diversified Transportation Solutions, assisted by EBA and Kam Research, began an analysis of transit service options for the City of Temple City. EBA played a pivotal role in community outreach efforts related to the fixed route transit study, co-hosting a community workshop to gather information on transportation needs and to provide the community the opportunity to participate directly in the study process. 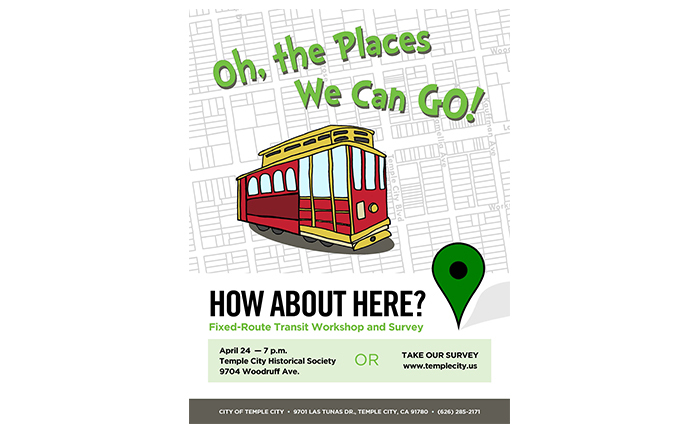 Approximately 75 residents and stakeholders attended the workshop, held on April 24, 2013 the Temple City Historical Society, where they received a presentation on the objectives of the project, and participated in a discussion about the community’s local transportation needs. EBA also developed a community transit survey as a tool to assist in determining the public’s knowledge and opinion of public transit, local travel patterns, current use and frequency of existing transportation options, and potential use and desired destinations if a local system were available. The survey was made available on the city’s website, conducted at selected community events, and provided to dial-a-ride transit users. A total of 438 responses were received. To ensure success, EBA was also instrumental in developing marketing strategies for a future local transit system, including branding and passenger information, awareness and image building and targeted ridership strategies.